She's loving the thing called summer. The water, the popsicles, the dirt, the sun... the whole thing. I like the fun but I could do with a little less heat. And being 7 months pregnant just doesn't help. Here we are at the end of June and I have two months left. Some days I just don't know how I will make it until September. But Liliane helps me through. She keeps me busy and helps take my mind off of my discomfort. 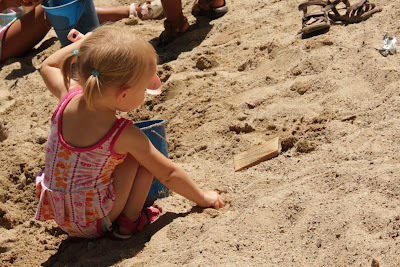 Oh: and she really likes sand. Cute! Nothing like going to the beach. ARe you at the beach? NOthing beats sand no matter where it is.